Employee Directory search forms help you to find staff based on their phone number, email, department, skills, location, direct reports and more. Custom fields can be used in searches as well. With Employee Directory Pro, you do not need to remember everything about someone to find information. Optional search operators help you locate people faster. In addition, you can search within the results to pinpoint who you are looking for. If you need to save information, you can export all or selected records to multiple formats. 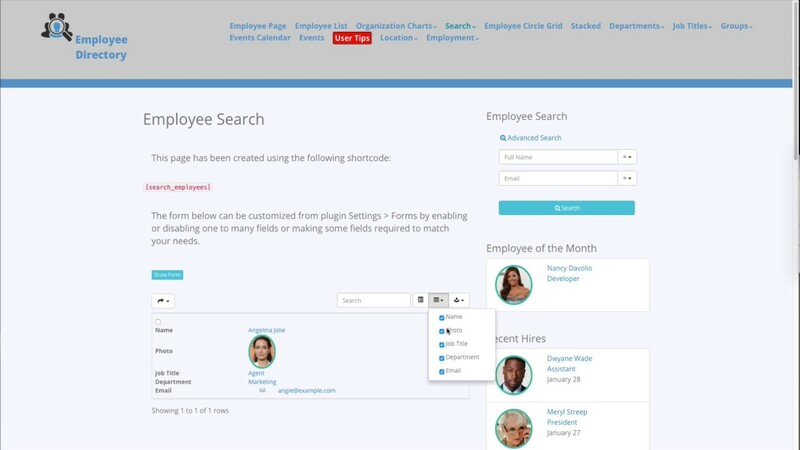 Employees can be searched using advanced search and mini search widget forms. Search forms with and without operators are available to support different use cases. Full name - you don't need to know the whole full name, just type in first or last name, it will return matching results. Custom fields can be used in search forms. Ajax enabled with paged navigation; results displayed without loading the page. Make one or more search elements required. Adjust search element column sizes. If you need to limit access to search forms, each search form can be changed to be displayed to logged-in users only from plugin settings form tab. In this mode, users see frontend login and/or registration forms in the search form page if they're not logged in.